Well... Its not christmasy... but its something. I've working on this wallpaper since November, trying to get it done before winter... alas, I failed. 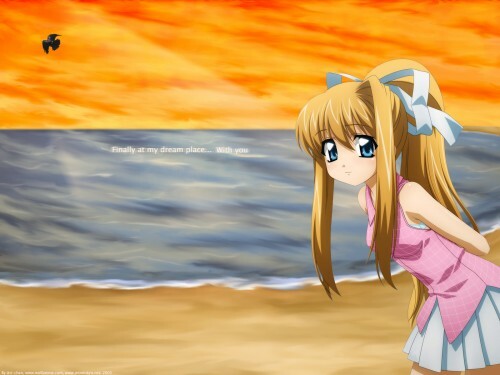 Anyway This picture is of Misuzu of Air, she always wanted to go down to the beach and play with Yukito, so I kinda decided to make it seem like that finally came true for her, even though Sora is in the backround (actually just a crow). The backround was made totally by Photoshop, like my last doujinshi. The backround always takes the longest. Either way, I'm a big fan of Air, and Misuzu, so I just had to do a wallpaper using her. I would like to do more Air wallpapers sometime again as well, though when I'm not sure. Anyway, I hope you all like this picture. Especially all you Misuzu and Air fans, this is for you. Very nice, love this wall, and the series ofcourse. I like the perspective of the sea, the work in background is clean, really pretty. The work in the image also this very well. Good, I hope that you have beautiful Christmas! Hey i didnt even know she was from an anime but im sure that u definetly drew it as good as the anime.